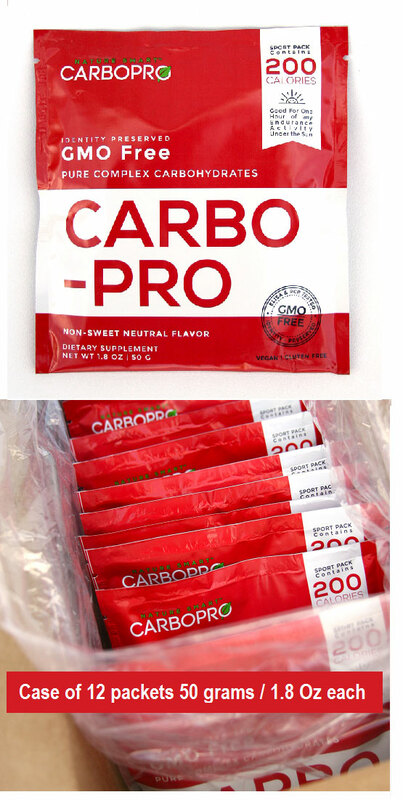 CARBO-PRO Packets - 50 G / 1.8 Oz CASE QTY 12 [CARBPAK] - $24.95 : CarboPro and Hydra C5 Ultimate Energy For Endurance Athletes, CARBO PRO manufactures the finest and the best nutrition supplements for Power Strength and Endurance Athletes. Based on the latest research and scientific findings. GMO-Free Identity Preserved. GLUTEN FREE. Contains NO preservatives, color, dairy, soy, sweeteners or yeast. Premium fuel, non-sweet (plain flavor) pure complex carbs, provides safe, clean, efficient calories for any exercise activity. Glycogen synthesis occurs in two phases - a very rapid rate of synthesis for about 4-6 hours (most rapid in the first 2 hours), then a much slower rate for the next 24 hours. What is GMO-Gree Identity Preserved (IP) ? 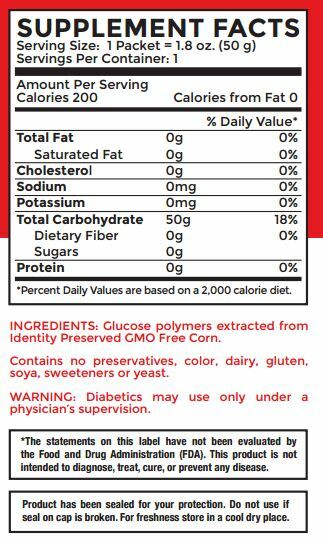 GMO Free, Identity Preserved CARBO-PRO, is derived from CORN (sourced in the USA). It is derived through a patented process of hydrolysis of certified Identity-Preserved (IP) CORN which has NOT been genetically modified by bioengineering technology. In order to ensure that it is IP, purchasing is done through contracts with farmers to buy corn which has not been genetically modified by bioengineering technology. Each lot is accompanied by proper IP documentation (signed certificate of handling that the Corn was IP at all times, and a signed certificate of origin listing location, producer, and seed corn brand). The corn is further tested by the ELISA procedure to screen for bioengineered genetic modifications. IP campaign is initiated by segregating approved product. Finished product is tested by PCR method by an independent laboratory to ensure integrity of the production run. Each identity-preserved lot can be recognized by “IP” following the lot number. There are products out there which contain one or two ingredients, at most, and yet have the audacity to make tall claims to provide energy, endurance, recovery, buffering lactic acid, anti-oxidants, etc., etc. Beware of them. Compare each CARBOPRO product in its category with the other product, and see for yourself the choice of variety, quantity, and quality of ingredients, and above all the best value. CARBO-PRO (best product / fuel for clean pure calories for training or racing); METASALT (best Salt capsule); INTERPHASE (best protein powder); HYDRA C5 (best comprehensive sports drink for Endurance, Strength and Power) MOTIVATOR (best mental energy capsule); RECOVERY Amino Power (best recovery product); VO2Max ENDURANCE (best ergogenic aid).